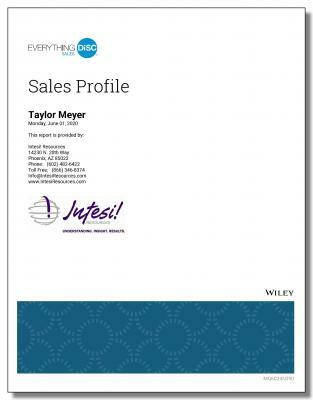 Effective Selling Into Your Client’s DiSC® Profile Style. When it comes to effective selling, one simple fact never changes: Selling is a relationship business. You already know all about your company’s products and services – and you’ve learned the fundamental aspects of the sales cycle. But have you ever asked yourself … What helps one salesperson develop immediate rapport with prospects, and not others? What is he or she doing that is leading to long-term client relationships? How can I learn to do the same thing? The Everything DiSC Sales Profile can help. Research shows that prospects are more likely to buy when they unconsciously trust, and feel at ease with, the salesperson. They are more willing to open up and provide information critical to closing the sale. It appears that they are almost “helping” you make the sale, as opposed to fighting you in the process. So how do you build this rapport? Understanding the behavioral style of their DiSC Profile and effectively selling into how they buy. The first key is to recognize that different behavioral styles do exist among prospects. You’ve probably seen from your own experience how one sales approach worked great with one person, yet you got a very different reaction from someone else using that same approach. How a prospect wants you to sell to them. How a prospect wants you to present information. How much information you present. How a prospect makes buying decisions. The same approach won’t work with everyone. As you learn to adapt your approach to make the customer feel more at ease, the relationship will improve and more sales will eventually result. You can identify an individual’s behavioral style preference by using the DiSC Profiles distributed by Intesi! Resources. This entry was posted in DiSC Profiles, Everything DiSC Sales Profile, Sales and tagged DiSC Profile, DiSC Profiles, DiSC Sales, Everything DiSC Sales Profile, Sales on 10/27/2010 by Steve Giles.